Charles Dutoit will act as music directorfor four years, but won't have that title. In a surprise move made without the knowledge or approval of its full musician membership, the Philadelphia Orchestra has appointed Charles Dutoit chief conductor and artistic adviser. Dutoit, 70, a longtime and frequent guest conductor here who oversees the orchestra's summer series in Saratoga, N.Y., will assume his new titles for the 2008-09 season after Christoph Eschenbach steps down. He has a contract through 2011-12, leading up to eight weeks of subscription concerts each season plus more in Saratoga and on tour. Dutoit will not have the title of music director, and as interim leader will have many but not all of of the same responsibilities as music director for four years as the orchestra searches for an eighth music director. The decision to engage the Swiss-born conductor was announced to the musicians of the orchestra by president James Undercofler backstage after last night's concert. Dutoit has a long and somewhat complex relationship with the musicians, administration and board of the orchestra. He is an ardent caretaker of the ensemble, remarking on their sound when they arrive in Saratoga each summer. He knows musicians by name and has an easy rapport with many of them. They immediately understand his style of rehearsing and performing. "I think that it's a good idea to have someone who knows the orchestras as well as he does and who can pull the sound out of the orchestra that he does," said violinist Barbara Govatos. "I'm sure for him it's also a dream come true. He will maintain the orchestra at a certain level until we find our next music director." Dutoit was passed over twice for the job of music director, and ended his decade as artistic director of the Mann Center in 1999 by publicly handing in his resignation to the audience before a performance of Orff's Carmina Burana. He said he did not want to conduct any more concerts at the Mann, but continued to lead subscription weeks downtown. Dutoit brings several important qualities to the table. He associates with an exciting roster of guest soloists, including powerhouse pianist Martha Argerich, to whom he was once married. He has an established audience following and assembles programs that flatter this orchestra and please listeners. His next appearances with the orchestra are March 1-6 (opening in Carnegie Hall) in a program typical of Dutoit: a Beethoven piano concert with Argerich as soloist, Sibelius' Finlandia (a work central to the orchestra's history), and Rimsky-Korsakov's populist Sheherazade. 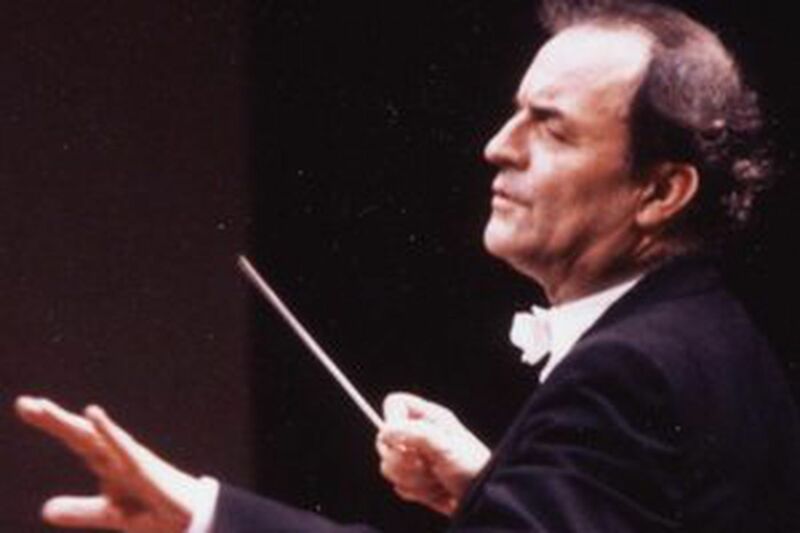 Dutoit, who first led the Philadelphia Orchestra in 1980, was at the height of his fame from 1977 to 2002 as music director of the Montreal Symphony Orchestra, an ensemble with which he made several landmark recordings. His Ravel Daphnis et Chloé is still considered one of the most sensuous and affecting on disc, and several other French works made a lasting impression. In his new post, Dutoit will take on some administrative responsibilities, the orchestra said in a statement: "This will include . . . the audition process, and representing the organization in Philadelphia and throughout the world as a partner in community relations and fund-raising efforts." Dutoit will not have authority on disciplinary action, and will not have authority over who might guest conduct the orchestra and what they program, said Undercofler. Although the players did not vote on the choice of Dutoit, orchestra management said the artistic advisory and members' committees approved the decision. "We feel it is vital to have an artistic leader in place who will provide stability for the Philadelphia Orchestra Association as we engage in a thoughtful, thorough and ultimately successful music director search," said a statement released by management and signed by two players representing those committees. "It is our opinion that this is best achieved by appointing Charles Dutoit to fill the leadership vacancy created by the departure of Christoph Eschenbach in 2008." Undercofler acknowledged that the musicians of the orchestra did not vote for Dutoit. "I saw this as distinctly different from a music director search, which I believe should be very, very inclusive. I initiated the concept of an interim so the orchestra would have the time to talk about the qualities they want and take the time that's necessary." As for the unusual title, Undercofler said he proposed principal conductor, "just because I was trying to indicate something that wasn't music director but had substance, and Charles thought chief conductor, which is used in Europe, but in this country is clever." Eschenbach's tenure will be among the shortest in the orchestra's history at five years, and when he announced his departure the orchestra had no heir apparent. It does have a promising though nascent relationship with the young Russian conductor Vladimir Jurowski, who has visited twice and whose conducting weeks here are expected to increase in coming years. The orchestra said it plans to formalize a process for its music director search this summer. Read his recent work at http://go.philly.com/peterdobrin.